Well, here we are…it’s December! Are you ready? Cards done? If not perhaps I can inspire you today with a little watercoloring??? The challenges are always one layer, always anything goes and this week’s optional twist is “snowman”. As always, the challenge is to create a one layer card only and if you use the optional twist, you’ll be entered into the monthly random drawing. Each card = one entry, so feel free to enter often to increase your chances to win. 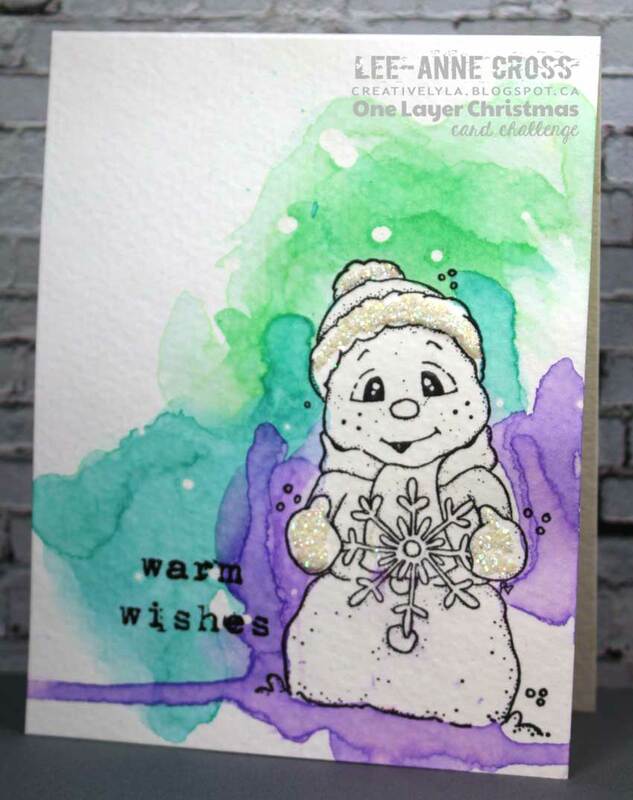 After masking off my little snowman…some simple watercoloring with Distress Inks, a bit of sparkle and done! Warm wishes back at ya, Lee-Anne. Love your watercolor splotches. They mimic Mr Snowman perfectly. Beautiful card! Such a sweet snowman and I love the background!! Absolutely darling, Leigh Anne! I love the glitter on the cute snowman! Brilliant work as always!! So glad that you join the fun over Virginia’s View “All About Glitter” Challenge! I so appreciate your awesome support for this challenge in the past. Hugs!